Nate and I both won our games from the previous round of the tournament, so we were matched up against one another. He rarely plays Bakunin and I’ve just started getting back into Corregidor, so it was a battle of derpy Nomads! Nate is an extremely shrewd, efficient player and is a very challenging opponent for me. I went into the game expecting to have a uphill fight and was not disappointed. Deployment was pretty straightforward. Nate had won the roll off and made me deploy first, so I deployed to be aggressive on the first turn. 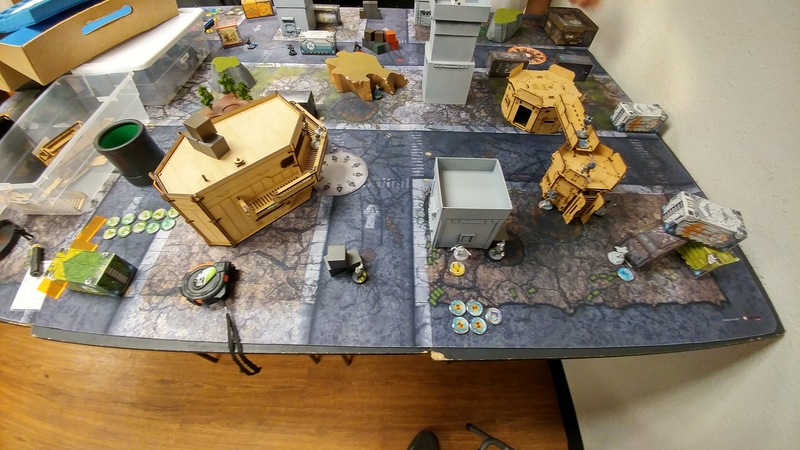 The board was pretty dense on my right and pretty open on my left, so I put my Mobile Brigada link team on the right with the HMG on a roof and the rest of the guys strung out behind. My MB BSG Lt was on the left, meaning that Nate would have to collapse the link team if he wanted to get to it. I deployed the MB MULTI Rifle further back, primarily just to keep him in coherency. My SpecOps went on the Comanche Barracks catwalk, prone, with her mine protecting her from any aggressive camo infiltrators, just inside the near left quadrant for me. Quadrant III for those of you who enjoy thinking about the Cartesian coordinate system. 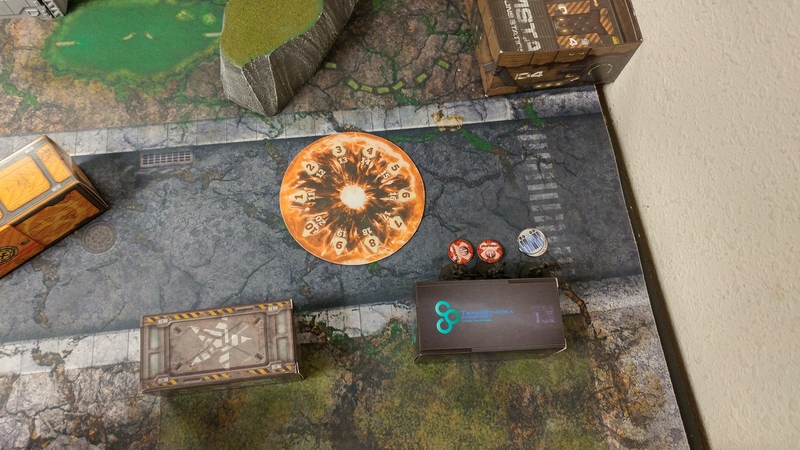 I saw an opportunity to cover most of the left side of the board with Intruder Banana’s HMG, so I deployed the Jaguar Haris to cover the Brigada link with Massacre’s Eclipse smoke and any potential Intruder Banana shenanigans with the Jag CR’s regular smoke. I figured I’d either put him atop the small grey building or atop the catwalks. I held Intruder Banana in reserve to respond to Nate’s deployment and passed deployment to him. Nate set up a Moira MSR atop a building covering my left and middle, backed up by a Zondbot. On my right, he castled up a Moderator link team with his HMG-toting SpecOps, a Moderator MSR, and his Moderator Paramedic atop a building and two more Moderators on the ground behind the building. His Riot Grrl Haris came down in the back on the right, behind some terrain, ready to Blitzen my HMG Brigada in the face if he advanced too aggressively. A pair of Zeros contested the midfield, with the KHD in the center and the FO on my right. Nate had set up to generate multiple AROs to my Mobile Brigada link with a lot of scary guns! I needed to grease the path for them to advance up the board, and I figured Intruder Banana would have some appeal to do this… So I put him down out of reserve on the catwalk where he could see all three exposed Moderators and the Moira, and then Nate plunked his Custodier HD+ Lt down in the backfield on my left, hidden from view. 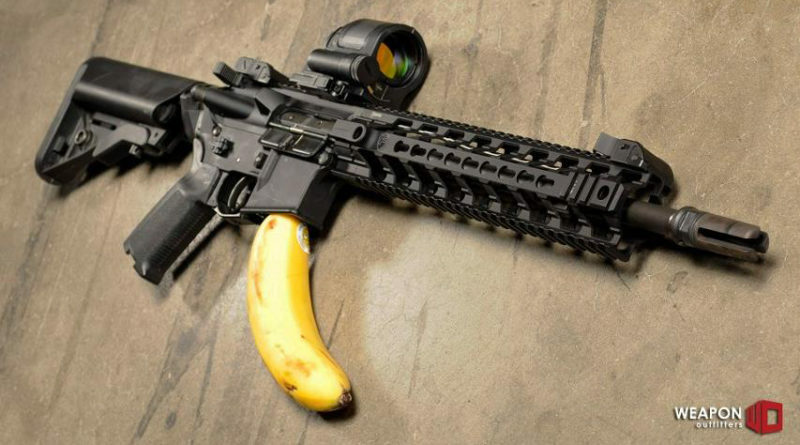 Time for Intruder Banana to earn his keep. I activate the Massacre Haris and chuck some smoke for him. Due to the way the smoke lands and how it interacts with the catwalk, the smoke doesn’t actually cover him from the Moira, so I just rely on surprise shot, camo, and cover. One burst later and she’s off the table. One down. I shoot the Moderator Paramedic through the smoke next, and I’m above the Moderator link thanks to the catwalk, so I remove his cover. 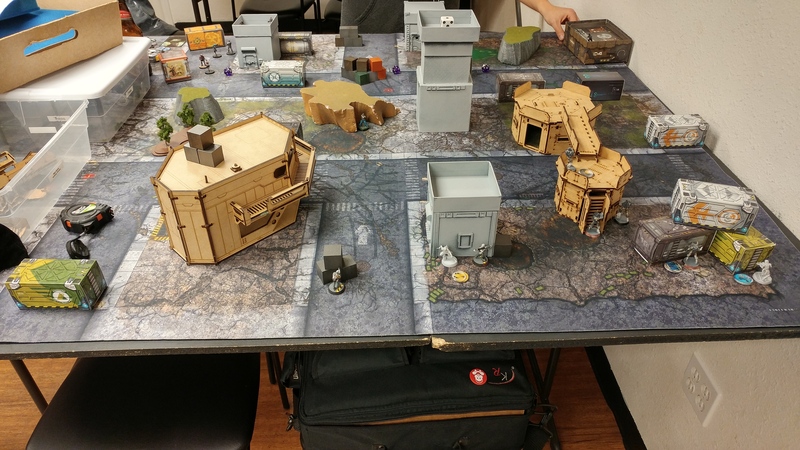 A few orders later, Nate is down a Paramedic, an MSR, and his SpecOps HMG is unconscious on the roof. I shot the Paramedic first to get bad rangebands on his combi rifle, and once he’s down the Moderators lose their +3 BS bonus. The HMG is slightly less scary than the MSR in ARO, so I shot that next, and then finally finished off the MSR. I’ve only got a few orders left so I spend them covering the MULTI Rifle Mobile Brigada with eclipse smoke so I can activate the Brigada HMG and plink a wound off the Riot Grrl Haris, forcing her back into cover, then knock out the Riot Grrl Specialist Operative before spending my last order to get my Jaguar Haris into a better position. Nate’s Morlock swarm advances into a hail of link team fire and Intruder HMG AROs. 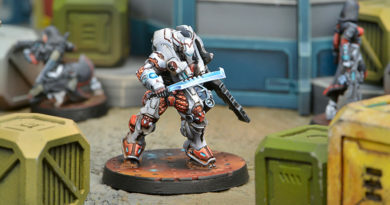 I’d use the phrase “when the smoke had cleared…” here, but I actually threw smoke with my Jaguar chain rifle to cover the Intruder when a Morlock through his LoF, so definitely the smoke had not cleared. 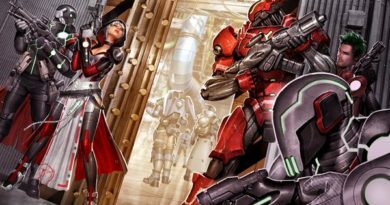 In any case, once all the shooting and grenade throwing had stopped, the CRAP Morlock (NWI) had been shot off the table thanks to shock ammo from the MULTI Rifle Brigada, the super jumping Morlock was knocked out, the dogged Morlock was dogged, and the +6 BTS Morlock was unconscious as well. 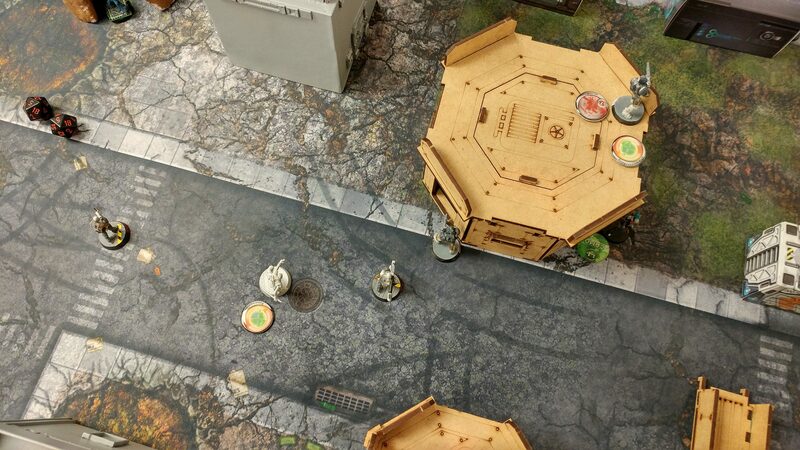 But, the CRAP Morlock managed to land a normal smoke roll to protect the Riot Grrl Haris from the Brigada link. Nate picks up the downed Riot Grrl with his nearby Daktari, reforms the Haris, and starts hunting my Brigada link team. The Intruder can’t see most of this, but there is a small LoF channel he can see through so Nate cautious moves through that and starts shooting Brigada with the Riot Grrl Spitfire. Over the course of two orders, I lose the MB hacker (probably should’ve failed guts). Nate pushes the Spitfire Riot Grrl forward to get the TinBot Brigada in her sights and in 24″, but this exposes her to the Brigada HMG. Nate elects to mag dump into the Brigada HMG, doing a wound and forcing him prone. The TinBot Brigada does a wound to the Spitfire Riot Grrl with her normal rolls, and is forced back into cover after taking a wound from the spitfire on a new order. The spitfire opens up on the MULTI Rifle Brigada and KOs him, sadly. Nate has killed one of my two possible Lieutenants now, so he’ll know for sure who my Lieutenant is next turn! With the last of his irregular orders, Nate shuffles the dogged Morlock around and takes a max-range pistol shot at something, but my Intruder puts him down before he can do any more damage. At this point, we remember that we should’ve declared DataTrackers. I had been thinking about making my SpecOps my DataTracker in the car on the way over, and Nate explains that he wanted to make the Haris Riot Grrl his DataTracker to make each Haris member an attractive target (kill the specialist operative, the spitfire, or the DataTracker). This means we’re both tied on quadrants with DataTrackers in the dominated quadrants, so we both get 2 points. The Intruder can’t see anything, so I activate the HMG Brigada and blast the Spitfire Riot Grrl off the table. I switch the link leader to the BSG Brigada and try to clear out one of the combi-rifle Riot Grrls, but she dodges out of the way as I’m outside of 8″ and am on 10’s. I shuffle the HMG Brigada up to a wall on the roof, settle the Tinbot Brigada into a better position, and retreat my BSG Brigada Lieutenant. With my last few orders I advance the Haris and throw the Intruder, the Brigada HMG, the Brigada Tinbot, and Massacre into suppression, breaking both links. We forget to do this until the end of the turn, but the only remaining Morlock gets gunned down by the Intruder as it spends its impetuous order. The Zero FO around the corner drops a mine then guns down the Brigada Tinbot in suppression. Nate tries to remove the HMG Brigada with the Riot Grrl Haris but loses her in the process. 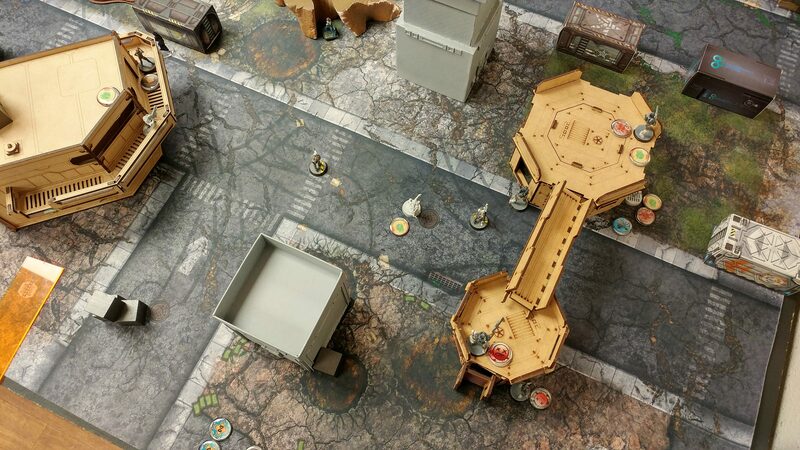 The specialist operative Riot Grrl finishes him off though, and then the Zero FO scoots up, drops a mine, then wipes out the Jaguar Panzerfaust in the same way that she killed my Tinbot Brigada. After dropping a final mine, the Zero FO retreats. With the Haris Grrl down, Nate doesn’t have a Datatracker anymore. We’re still tied, but I have a point for my DataTracker, leaving the score at 4-3. I spend my Lieutenant order to dodge the mine, which unfortunately hits Massacre, dropping him unconscious (hooray shock immunity!). I run my Brigada up and shotgun down the remaining RiotGrrl and the Zero FO that caused all that trouble last turn, and then settle everyone into slightly better positions with a coordinated order before passing a Regeneration roll on Massacre. I’ve now got stuff in every quadrant. Quadrant I (counter-clockwise from far right) has my Brigada BSG, Quadrant IV has a slightly worse-for-wear Massacre, Quadrant III my Intruder and SpecOps, and Quadrant II has my Jaguar chain rifle. Nate spends awhile thinking about his best options. One option is to run his camo token in the center (a Zero KHD) up the stairs to my SpecOps’s hiding spot, eating a mine on the way. The other option is to remove my Brigada BSG, Massacre, and the Jaguar. He chooses option 2. His Daktari comes out of hiding and puts a wound on the Brigada. I elect to fail guts and break LoF. He rolls a Moderator out for his backfield, and puts a wound on the Jaguar, but I go dogged and break LoF. The Zero KHD activates and spends his remaining 3 orders shooting at my Brigada BSG at outside of 16″. I spend those three orders dodging and passing ARM, trying to dance around breaking LoF while remaining in the quadrant. The game’s over, so we break out the tape measures and find that I have Quadrants I, III, and IV while Nate has II. I’m dominating more, one of which with my DataTracker, and Nate’s controlling the HVT (and I chose IntelCom). Well, I held the Intruder HMG in reserve this time. Totally paid off. 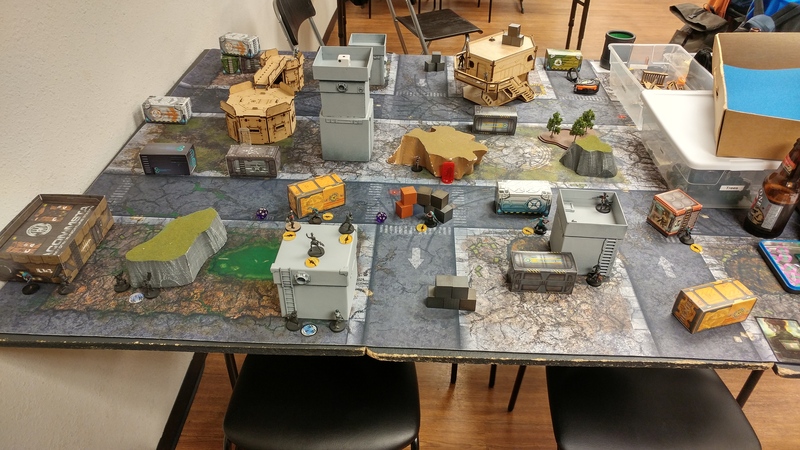 Nate had sorta counted SWC, noted the missing Brigada ML, but didn’t deploy assuming I would have an Intruder HMG in that particular position. The Intruder HMG killed a ton of models. 3/4 Morlocks, 3/5 Moderators, and the Moira. I like the dual HMG build from this list. Having two face punching tools is great in a 10-order list. Extremely high threat with smoke from the Jaguar, and backed up by a 5-man link and Haris to boot. There’s a lot of discussion on the forums lately about the Kriza Borac, and while it’s great at winning face to face rolls, I cannot isolate units and face to face them individually like the MSV2+ Smoke combo can. It’s not strong because of the mods, that’s just a side benefit. It’s strong because you can do a reverse coordinated order and isolate AROs so you can HMG them down one at a time. Infiltration, Mines, and Grenades. The perfect profile to sit on a roof in the midfield and be really annoying. A great DataTracker as well with the above kit. They fight with the Brigada for orders, but having B2 smoke to protect the Intruder and the MB link is really important. In this list, where the Intruder and the Brigada link are my main workhorses, they basically exist to anchor the center while the two heavy hitters anchor the flanks. The Haris can provide smoke for both flanks, and then if the Intruder dies they can take over his flank. I think this above usage case is probably the right one. Provide smoke and some AROs, and then take over for the flank that crumbles. I suffered from 5-man link blob syndrome this game. Should’ve had better positioning on my combi-rifle Brigada, and put more things on top of the roof (while maintaining spacing to avoid getting missiled). I think I just need to be better about placing them, but it’s hard to get everyone in cover when you’re hugging a octagonal building. I am just realizing how powerful linked MULTI Rifles are with all the cool ammo options. I don’t know why this is a surprise to me, I love MSRs, but I guess it’s just because I don’t really use MULTI Rifles all the time. I think I broke the links properly this time, but I need to take a moment and eyeball my movement before I commit. I moved both links into weird positions and was left without orders to fix it or had to waste orders fixing it later. I had a lot of units out of place this game and should’ve been punished more for it. Nate did a great job with the Zero FO doing just that, but had he had more orders it would’ve been much, much worse. I like this list, I think it has a lot of threats and retains order efficiency as it degrades, I just need to learn to pilot it better. Thanks for the BatReps. I really like your site and your articles. I particularly like reading your summaries at the end of the Bat Reps.